First time making Cranberry Apple Walnut Pie, Dec. 2010. With the Canadian Thanksgiving weekend about to begin, I thought I'd share this recipe I found on allrecipes.ca a few years back that I made some adjustments to. I usually make it at Christmas, but it would totally work for Thanksgiving too. Tastes great and the house will smell amazing while it cooks. 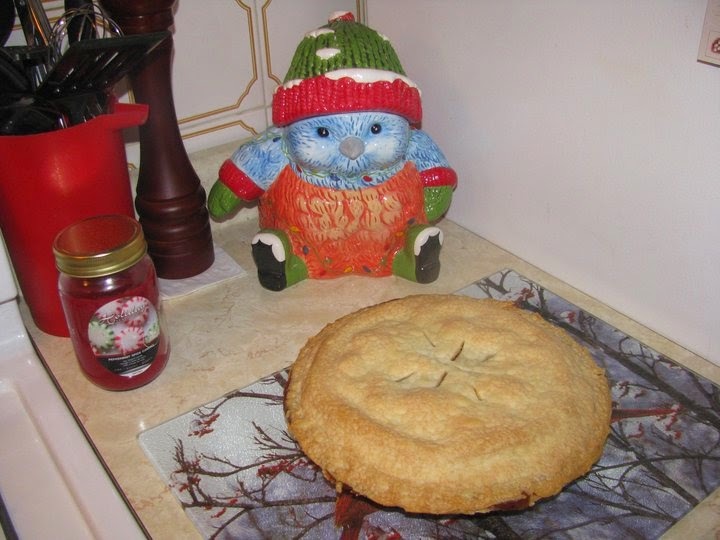 * 1 recipe for a 9" double pie crust or use the ready made Tender Flake Pie Crust like I do. Peel, core and slice apples into a large bowl. Add can of Cranberries to apples. Combine all other ingredients into a medium size bowl and mix well. Add this mixture to the apple and cranberry mixture, mix well. Pour filling into lined pie plate, cover with top crust. Crimp edges and cut slits in top crust. Bake approximately 1 hour, until crust is golden brown and filling bubbly.